Life around the here is moving rather quickly this week. Several things are converging at the same time. The big thing is the upcoming Solemnity of Saint Francis on October 3rd and 4th. The plan is to get together with other Franciscans around the area on Sunday, October 3. The Secular Franciscans are having a profession that day. Therefore, we’ll be there to welcome a new sister into the Franciscan family, along with one of the Friars Minor of the Holy Name Province. 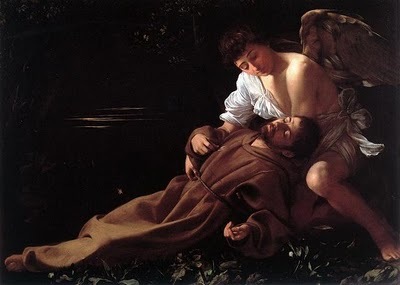 Later that evening we will gather to celebrate the Transitus of our Holy Father St. Francis. The Transitus is a beautiful celebration. It takes place within the Liturgy of the Hours. During the celebration, we recall Francis’ passing from this world into eternity. If you have ever been to a Jewish Seder, the Transitus follows that format. One person asks the story and then it is narrated through prayers, songs and scripture readings. It is flanked on both sides with the parts of Vespers, the Psalter at the beginning and the Gospel canticle and prayers of intercession on the concluding side. There is always a relic and lots of candles and incense too. On the morning of the 4th we celebrate the solemn mass for the Solemnity of St. Francis. Since the different Franciscan communities down here are small, several communities gather for this great feast. It’s a wonderful tribute to our Holy Father, because it’s one of the few times a year when the communities gather as one family acknowledging their common Franciscan heritage. But the Solemnity of St. Francis is more than just a memory. If it were that alone, it would be like any other national holiday in which we remember a national hero. It’s a time to thank God for the gift of our call to serve him following it the footsteps of St. Francis. God will never be outdone in generosity. He not only calls Francis to the perfection of the Gospel, but he shared that call with millions of men and women around the world from 1209 to this day. It’s incredible to think that no matter how small one Franciscan community is, that we belong to a much larger family that finds itself around the world and that spans eight-centuries. To better prepare for this celebration, the Brothers of Life have taken this week to spend more time in prayer, reading and studying. We are out less. But we have doubled our time before the Blessed Sacrament. We’re very fortunate, because there is a parish about five-minutes from our house that has daily adoration from early in the morning to the evening. It’s a wonderful experience to be there with Jesus. I can’t explain it. You just have to experience it for yourself. 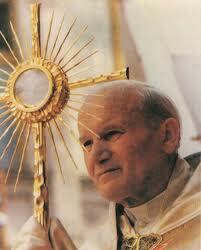 But you just can’t leave once you realize how wonderful God is and how present he truly is in the Blessed Sacrament. It’s incredible to look at the host and realize that this is the same man who walked through all those cities and towns in Palestine healing the sick, preaching, making people feel loved and wanted by God, feeding the hungry and forgiving sin. I’m in awe at the thought that this was the same man with whom the Apostles spoke, ate and slept for three-years. St. Francis of Assisi wrote a wonderful prayer that he recited before the Blessed Sacrament, before every crucifix and every time that he remembered the Blessed Sacrament but was unable to get to a Church. “We adore you O Christ and we bless you, here and in all of your churches throughout the whole world, because by your holy cross you have redeemed the world.” It’s beautiful to think that one can remember the most Blessed Sacrament, when one cannot get there and still be closes to the Lord. Being there, with another brother kneeling next to you just adds to your love of neighbor and experience of God’s love.